INTERNET users spared no time mocking the Notre Dame’s blaze on its Wikipedia page after a devastating fire engulfed the iconic landmark this evening. Under the Architecture section of the page, the cathedral’s functional status was edited to say: “On fire and dying inside :)”. Internet trolls updated the Functional Status to this while the Notre Dame was up in flames The status of the iconic landmark was later updated to reflect that is unknown what the extent of the damage is A fire broke out at Notre Dame at 5.30pm local time and flames were still burning more than five hours later As the inferno raged on, the status was also updated to “On Fire”. [bc_video video_id=”6026448981001″ account_id=”5067014667001″ player_id=”default” embed=”in-page” padding_top=”56%” autoplay=”” min_width=”0px” max_width=”640px” width=”100%” height=”100%” caption=”Notre Dame fire – This is the moment the Spire collapses as blaze breaks out at the cathedral”] Its functional status has now been updated to say “Unknown (Fire damage)” after firefighters saved the main structure of the cathedral from complete destruction. Crews are still working to contain the flames – with the latest images showing the damage from inside the landmark. Flames are still burning on the roof as debris covers the first rows of pews inside the cathedral. Another image shows missing sections of the ceiling. Dramatic photos show the damage caused by the blaze that destroyed the 850-year-old’s church’s spire and much of its Gothic roof. The fire broke out at 5.30pm local time this evening and 400 firefighters were deployed to battle the inferno. France’s Deputy Interior Minister Laurent Nunez said “the fire had since decreased in intensity”. Emmanuel Gregoire, the deputy mayor of Paris, said the cathedral had suffered “colossal damages”. Police said there have been no deaths, but one firefighter has been “seriously injured”. 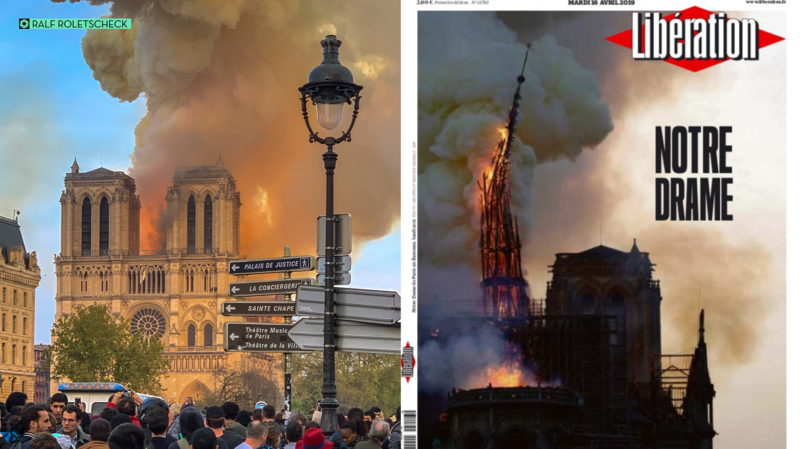 [article-rail-section title=”MOST READ IN WORLD NEWS” posts_category=”14″ posts_number=”6″ query_type=”popular” /] French President Emmanuel Macron tweeted: “Notre Dame of Paris in flames. “Emotion of a whole nation. Thoughts go out to all Catholics and all of France. Like all our countrymen, I’m sad tonight to see this part of us burn.” He later said: “We will rebuild.” The cathedral’s functional status was also update to just say ‘On Fire’ This image shows the damage inside the cathedral as a fire can still be seen burning in the ceiling This photo shows the flames through damage in the Notre Dame’s ceiling Crews are battling to put out the flames, which had largely been contained by the time they went inside the church This aerial shot shows the scale of how much the fire had spread [bc_video video_id=”6026515077001″ account_id=”5067014667001″ player_id=”default” embed=”in-page” padding_top=”56%” autoplay=”” min_width=”0px” max_width=”640px” width=”100%” height=”100%” caption=”French President Emmanuel Macron address the fire that has partly destroyed Notre Dame Cathedral “] We pay for your stories! Do you have a story for The Sun Online news team? Email us at tips@the-sun.co.uk or call 0207 782 4368. You can WhatsApp us on 07810 791 502. We pay for videos too. Click here to upload yours.